Japan survived a furious Cuban comeback to claim the inaugural World Baseball Classic title 10-6 on Monday. Japan jumped into a 4-0 first-inning lead at a sold-out Petco Park as Cuba's amateur hurlers needed three pitchers just to get the first three outs. Cuba recovered from 6-1 down in the fifth when Frederich Cepeda's two-run homer in the eighth made it 6-5. But Ichiro Suzuki's single and a bases-loaded, two-run double from Kosuke Fukudome sealed Japan's victory. It was only their fifth win in 38 meetings with the Olympic champions. "This is probably the biggest moment in my baseball career," said Seattle Mariner's All-Star outfielder Suzuki. "I was always thinking we would need a good event to decide the world's best in baseball. "We really wanted to win this game today and I didn't even think about the upcoming season. "I didn't really care if I got injured in this game, that's how much I really wanted to win this one. That's how we were driven to this championship." 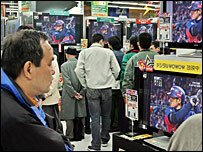 Fans packed into sports bars across Japan to watch the game live on what was Vernal Equinox Day, a national holiday. "I thought my heart would stop," said Kanako Miyake, a 25-year-old ad agency worker. "But we won, so everything's fine." Japan only reached the semi-finals thanks to Mexico's shock win over the pre-tournament favourites United States. But they made the most of their reprieve to beat South Korea 6-0 for a place in the final. "Up until Japan beat South Korea, I didn't think we would make it. But after that game, I finally thought we had a chance," said Shun Kando, 43, a theatre actor. "I'm so happy. Japan are the world champions." Baseball is the number one sport in Japan but has seen its popularity come under threat from football. 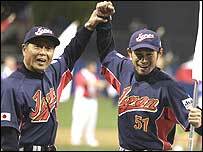 "I think that this win may bring Japanese young people back to baseball," added Miyake. The final provided a fitting finale to an experimental 17-day, 16-nation competition that proved hugely popular, attracting 737,112 spectators to 39 games. "This is a game that will go down in history," said Cuban manager Higinio Velez. "This is the first Classic, it was the first final game of a Classic. Japan won and we congratulate them for that. "They deserve these words of congratulations for the way they played, the courage, the type of game they played."